Everton's Moyes To Replace Ferguson At Man United : The Two-Way David Moyes will be succeeding the world's most famous soccer coach. Alex Ferguson announced this week that he'll retire at the end of the season. Moyes has led the English Premier League's Everton club since 2002. One day after the world's most famous soccer coach announced his upcoming retirement, his replacement has been chosen. "The manager met Chairman Bill Kenwright early yesterday evening (Wednesday 8th May) and confirmed his desire to join Manchester United." 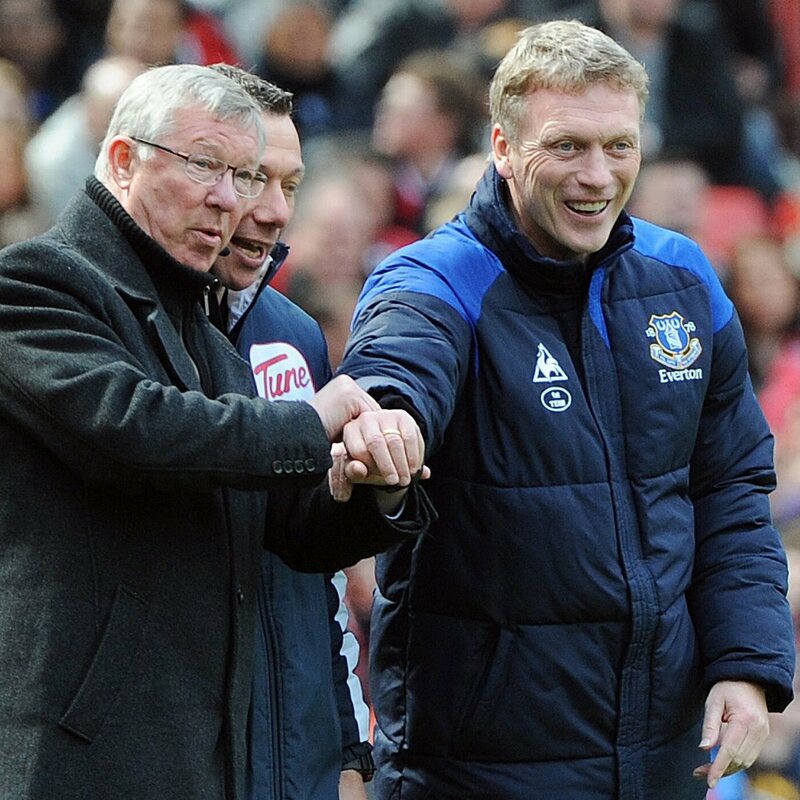 Manchester United manager Alex Ferguson (left) and Everton manager David Moyes (right) during a match in April 2012. Moyes will succeed the retiring Ferguson at Man United. And just before 11 a.m. ET, Man United posted word on its Facebook page that Moyes would indeed be joining the club. In a related statement, the team said it had struck a 6-year deal with the 50-year-old manager. Since Man United manager Alex Ferguson, 71, announced Wednesday that he's retiring after 26 seasons leading one of the world's most famous soccer teams, Moyes' name had been near or atop the list of those likely to replace him. The Guardian notes that "Moyes leaves Everton having never won a trophy since taking over in 2002. But he stabilized the club and in more than a decade Everton finished outside the top 10 twice, qualified for the Champions League once, and reached an FA Cup final." Ferguson, on Man United's website, says of Moyes that "there is no question he has all the qualities we expect of a manager at this club." Related post: Alex Ferguson: A Legendary Manager For An Iconic Franchise.